Lucas earned his master’s in social work from the University of Denver with a specialty in providing clinical and community social work to under-served Native American, Alaska Native and migrant populations. Over 10 years of experience in holistic and integrated health systems, traditional healing modalities, as well as teaching for the University of Alaska School of Social Work has influenced Lucas’ career path to focus on advancing the practice of integrated care at an organization like One Community Health, which promotes values of social justice as a part of health and wellness. Originally from rural southwest Colorado, Lucas grew up with a deep connection to the natural world and, when not working with the OCH teams, can be found outside riding bikes, skiing, snowboarding, camping, or at home perfecting his red chili recipe and working on art projects. A licensed professional counselor in Oregon, Maja graduated with a master's degree in community counseling in 2009 and began to work at a holistic Eating Disorder Treatment Center in Arizona. For seven years, she worked in residential treatment helping women and girls suffering from eating disorders and trauma. Most of her career has been devoted to helping women and teens love and accept their body, teach healthy coping skills, and heal from traumatic experiences. She is bilingual in Swedish and English and has lived in Europe and the Middle East, which has increased her passion for cultural awareness. Maja is an avid sailor, loves the outdoors, and spends many weekends exploring the Gorge wilderness. Rebecca Garrett is originally from San Diego. She started her medical career in the United States Air Force in 1996. Throughout her professional life, she has been able to experience many different medical settings. However, she made the Columbia River Gorge her home in 2006. Here, she and her two children enjoy the many outdoor activities that the Gorge has to offer. She has been a part of the One Community Health family since 2014 and currently works as an RN in the Medical-Assisted Treatment (MAT) program that we offer as part of our behavioral health services. Naomi has been working to support the mental health needs of underserved and/or marginalized populations for almost two decades. A licensed clinical social worker, Naomi earned her Master of Social Work from Portland State University in 2002. She’s also a developmental psychologist specializing in autism, earning her doctorate from the University of California in 2012. Her primary focus has been children and adolescents, particularly those with complex needs. She has lived in the Gorge for three years and spends much of her free time exploring it by walking her small dog or running. She’s proud to be part of the team at One Community Health, helping to integrate care of patients’ behavioral health needs with their physical health. Michael has diverse experience and knowledge working in the mental health and substance use treatment field for over two decades. He started his career as a volunteer then went back to school for psychology and basic medical education. Later, Michael obtained his certification as an Alcohol and Drug Counselor (CADC). Michael’s clinical expertise in mental health and addictions draws heavily from his wealth of experience in both inpatient and outpatient settings, including the Dammasch state mental hospital, Oregon Health Sciences University (OHSU) Psychiatric Crisis Unit, DePaul residential treatment in downtown Portland, and Treatment Services Northwest. Michael has developed curriculum and taught classes on the biology of addiction. He moved to the Columbia River Gorge in February of 2016 to join our team. Michael’s approach is to help people access the internal and external means to establish a healthy life and balance, with an understanding that people have experiences in life that cause an imbalance affecting psychological, physical and spiritual well-being. Michael’s hobbies and interests include photography, cycling, taking his dog camping, and seeking out swimming spots in rivers across the Pacific Northwest. Kim came to One Community Health to pursue her passion for health in body and mind. After graduating from Washington University’s Brown School of Social Work, Kim worked for a pediatric surgery clinic in the Amazon of Peru, the Children’s Hospital of Wisconsin, and Sky Lakes Medical Center in partnership with AmeriCorps. Each experience furthered her interest in socially just and community-centered health, and she is delighted to be a member of the One Community Health Team. She especially enjoys working alongside patients to develop individualized and holistic care plans to support their whole health. Kim is a self-proclaimed life-long student of health and spends her free time exploring the beautiful state of Oregon with friends. So far, she has been to 25 countries on these adventures, but is proud to call the Gorge her home. Although born and raised in Kansas City, Mo., Emily Rotert has made the West her home for some time. After reveling in the Colorado mountains, she moved to Oregon in 2015 to learn the beauty of the Pacific Northwest. This backdrop inspires and supports Emily’s soul as she lives among and works to serve her community. Emily brings a background in mental health counseling and studies in human development and family systems to her position at One Community Health. Previously, she has worked with children, adolescents and families in both community and school-based settings. She has a strong belief that the human spirit is resilient at heart, with a natural tendency toward health. She feels all human beings deserve the opportunity to realize their full potential and is passionate about offering support to underserved communities that often face additional barriers to achieving happiness and wellbeing. 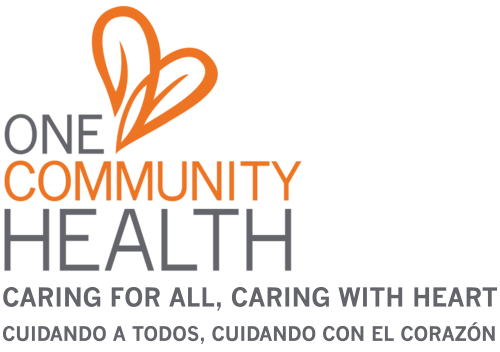 At One Community Health, she is grateful to be addressing behavioral health concerns to support individual and familial health, advocating for greater community needs, and addressing issues of social justice. Empathetic, curious and quick to laugh, Emily’s approach to behavioral health aims to be inclusive and patient-centered. When she’s not in the clinic, Emily spends time romping in the woods with her dog, Wylder, practicing yoga, traveling and learning from different cultures. People who meet Gaby Swisher say she’s logical, persistent and passionate. At One Community Health, she brings not just those personal characteristics but her hard-earned professional skills to a health care team that values social justice and whole-person health. Gaby has a bachelor’s degree in social work from Ohio University. After college, she worked with adults with severe mental illness before returning to earn two advanced degrees—a master’s in social work from Portland State University and a master’s in public health. In addition to her academic education, Gaby has experience lobbying and community organizing for the protection of tenants and for affordable housing initiatives, as well as working with the housing authority to provide supportive services for individuals using Section 8 vouchers. At One Community Health, she’s deeply passionate about our mission, plus addressing key determinants of health and the immediate needs of individuals and the community at large. In her spare time Gaby can be found hiking, walking her dog, skiing, canoeing and traveling. One interesting fact about her: Gaby has never had a dark-colored soda. Judy was born and raised in the Columbia River Gorge. Her parents originally immigrated from Mexico to Oregon and established their roots in Hood River, as migrant farm workers. She has fond memories of the care she and her family received from One Community Health. Judy is honored to be on the "other side," now providing behavioral health services to the community. Judy has a master’s degree in social work from Portland State and is currently in the process of obtaining her clinical social work license. Most of her clinical experience came from working at Mid-Columbia Center for Living, providing individual and group therapy to adults, youth and families. Her personal interests include spending time with family, friends and two dogs. She also enjoys exploring the outdoors.